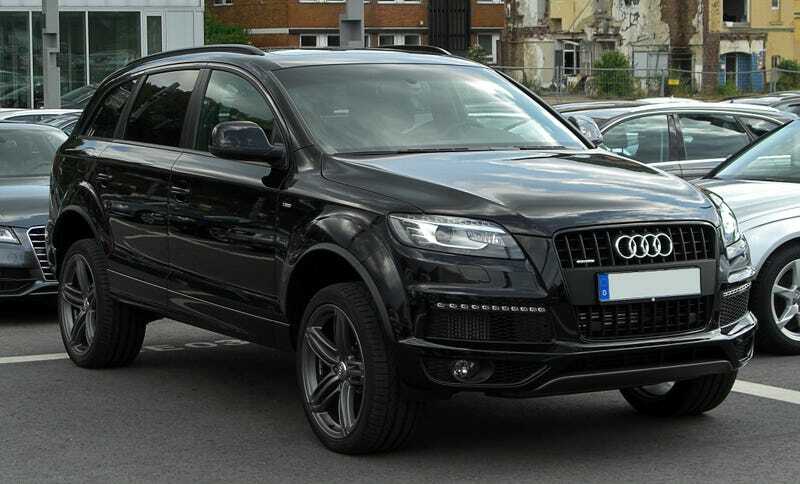 What's the opinion on the Audi Q7? Here's my take. Took my mom to look at a Q7 today, she loved driving it which was surprising because she tends to dislike anything bigger than her Odyssey. Here’s what I thought about it. Exterior wise is typical Audi. Understated but nicely aggressive in the S-line trim with the big wheels. In the words of Rusto, it looks like a minivan. I kind of see what he’s getting at with the somewhat blobby shape. Again, the S-line kit makes up for it. The headlights look nice, I still think Audi is killing the DRL/LED game. I enjoyed the interior. While the third row is a little bit of a squeeze, being able to adjust the second row makes it fairly usable. Lots of space with all the seats down too. I loved the panoramic roof. Really made the black interior lighten up and it gave a very roomy feeling. Sound system was good, I don’t know much about it so I won’t go into detail but comparing it to the Harmon Kardon system in my W204 it sounded good. Everything felt high quality and the leather was very supple. The dash was nice, not too busy and all buttons and switches felt good. What I didn’t like was how small the nav screen was. The Q7 isn’t exactly a small car, yet the nav screen was the same size (maybe a little less wide) than that in my E90. The particular vehicle we tested out was new. I know this is said about many new cars, “they hide their weight and size so well blah blah blah”. When I first got the Q7 out of the parking lot it didn’t take long to get used to the size. I kept thinking I was veering into the left lane but whenever I checked my mirror I had more than enough room. Definitely feels smaller than it looks. After about a mile or two I was completely comfortable in it and had a good idea on my lane placement and everything. My mother felt the way, which is impressive considering how she really doesn’t like driving all that much. We both loved the back up camera and parking sensors. This car had the 3.0 TFSI engine. I’d prefer a TDI but the $6k price difference new (and the lack of TDI at my dealer, apparently a popular choice) led us to test out a gas engine. It was very smooth. It started raining and there was traffic so I couldn’t get a sense for the performance. The transmission shifted smoothly and fairly quickly. The steering was pretty light but direct. Definitely no sports car, but I wasn’t expecting much going in. Totally fine for what it is. Overall I think the Q7 is a pretty solid choice for 3 row luxury SUV’s. Tech was nice, build quality was nice, and it drove fairly well. Price as tested was $55k. Not terrible, but I’m gonna direct my folks to go CPO. Maybe even get one with a Carmax warranty. Any VAG/Audi guys have any advice? I know some of you must have some experience with these.